Spring loaded jaw mechanism for positive and automatic spent mandrel release. 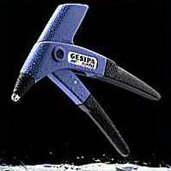 Compact design, die-cast aluminium tool body and high grade steel lever contribute to the outstanding durability. Work Capacity- Up to 5mm/Alu and 4mm/Stainless Steel.